Europe’s southernmost ski resort, Sierra Nevada in Granada, with its imposing mountain peak of Mulhacén (3.482 m) is a wonderful combination of sun, snow and Mediterranean Sea, which sets this region in the province of Granada apart from most other places in the world. Although it might not compare to the slopes in the Alps, its affordability and accessibility turn the resort into a great destination for families that are rather less experienced in slope etiquette, providing a delightfully welcoming atmosphere that is sure to be enjoyed by all ages. Below we have collected some useful up-to-date information for skiers and boarders of all levels and leisure time activities for children and those who are not so much into skiing. The resort base Pradollano is located at 2100 metres over sea level, just half an hour from Granada and only 45 minutes from Almuñecar on the Costa Tropical. Sierra Nevada is a 90 minutes drive from Malaga Airport on the Costa del Sol and about 2 hours from Marbella, for the ones who want to combine beach and snow. They are waiting for you even when your flight is delayed. You know what you have to pay with no hidden charges. The price is excelent, sometimes even cheaper than a taxi! Friendly and bilingual chauffer always willing to help with your luggage. Top recommended Malaga airport transfer to Sierra Nevada companies. With 3 international airports nearby, Granada, Malaga and Seville, train and bus station, Granada is a very well-connected city. If you are about taking a trip to Sierra Nevada we recommend booking a flight to Malaga airport, and then you can use public transport, rental car or taxi company to get to Sierra Nevada in less than 2 hours. Malaga's companies use to offer the lowest prices in Spain, due to the very competitive market of travel services along the Costa del Sol. The top station in Sierra Nevada is located on the Veleta peak, on 3398 m. In total, the vertical drop is 1200 metres with a more than 115 runs over 100 km, from which are 16 green runs, 40 blue runs, 50 red runs and 9 Black runs. The longest run is "El Aguila", with more than 6km. There is one cross skiing circuit of 4 km length. The total number of lifts is 29, of which are 2 gondolas and 16 chairlifts; the lift opening times are from 9:00 to 16:45 hours. There are 6 skiing areas with the following names: Veleta; Laguna De Las Yeguas; Borreguiles; Lomar de Dilar; Rio Monachil and Parador. Snowboarders are welcomed with open arms in the Sierra Nevada and special facilities are available. The main run for boarders is the "Tubo de Borreguiles", a freestyle park exclusively for boards with a half-pipe and full range of jumps and rails plus a small lift. Night skiing is available on Saturdays from 19:00 to 21:39 hours (subject to weather /snow conditions) on the long El Rio slope, which runs right into the village and provides a wonderful spectacle when viewed from the café terraces of Pradollano. Pradollano is the heart of the ski resort, from where two gondolas and two chairlifts transport you to the Borreguiles ski station on 2.645 metres. From there you have access to a total of 80 slopes. From Borreguiles you can get further up the mountain and cross to other areas such as Laguna de las Yeguas and Lomar de Dilar and Veleta. From Veleta, the highest point, you can enjoy on clear days spectacular views of the Mediterranean coast, Gibraltar and even Africa. The majority of Pistes in the resort are intermediate slopes and areas such as Monte Bajo are fantastic for those who want to ski long, mixed condition runs. More challenging are the mainly red runs of Laguna de las Yeguas and Veleta, this area also tends to get less crowded. When is the best time to visit Sierra Nevada? The best time to go to Sierra Nevada is between the months of December and March but is recommendable to check the track status before if you plan to ski. Wednesday use to be a discount day and because of that tracks use to be crowded...recommended day if you want to spend less money but at the same time not recommended if you want to ski more quiet. If your plan does not include skiing in Sierra Nevada but trekking or enjoying nature I would recommend the months between April and June, if you have enough time you can also visit Malaga and enjoy the beaches. This is a report for Granada / Aeropuerto, Spain. The report was made 33 minutes ago, at 21:30 UTC. The wind was blowing at a speed of 1.5 meters per second (3.5 miles per hour) from west (280°). The temperature was 11 °C (52 °F), with a dew-point at 10 °C (50 °F). The atmospheric pressure was 1007 hPa (29.74 inHg). The relative humidity was 93.5%. There were scattered clouds at a height of 1219 meters (4000 feet) and scattered clouds at a height of 1433 meters (4700 feet). The sky was overcast from a height of 1676 meter (5500 feet) The overall visibility was greater than 10 kilometers (6.2 miles). 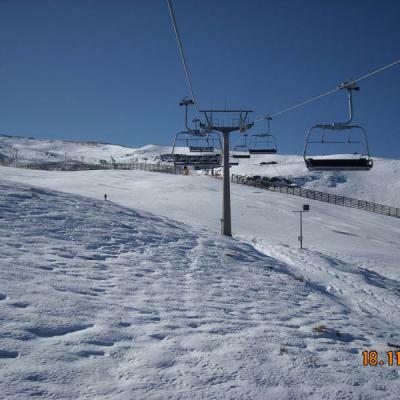 Sierra Nevada snow and weather: From late November until early May there is usually snow in Sierra Nevada. The best month for skiing are January and February and the first half of March. If during the months mentioned before there is no enough snow becouse the weather, Sierra Nevada station and staff turns snow cannons on to ensure a minimum number of kilometers of tracks to ski. The best conditions for skiing and snowboarding is in the morning until one o'clock. The snow is hard on the night. The Sierra Nevada is popular for having the highest number of hang-over skiers per piste which points to great entertainment during day and night. In Prado Llano you find nice different bars opened until late. People who want more than just fun with snow and are looking for partying should pay a visit to Granada a great Spanish town. Not everything is just about skiing, as the great nightlife is worth an experience. Pradollano is a very social resort with many bars and cafes with a great atmosphere and which are very animated at night, especially on the weekends or during a Spanish holiday. Besides skiing in Sierra Nevada this place has much more to offer. Some options may be: the less known ski station Fondo in Puerto de la Ragua or the great amount of hiking trails for all visitors wanting to enjoy the amazing sights from the Sierra’s mountains. 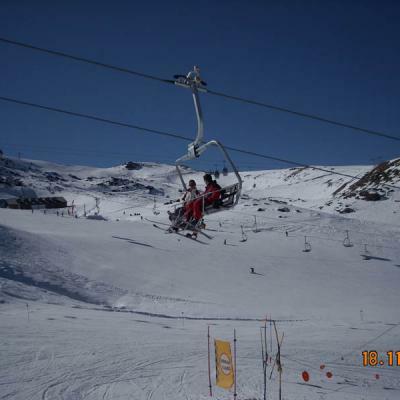 Sierra Nevada is the most southern ski station in Europe and the highest one in Spain. Its main feature is the mild climate offering extra joy to all visitors. The region is located about 27 km from Granada city and 168 km from Malaga. Further activities offered in Sierra Nevada mountains are trips with dog sledges and the snow board park. Summer time is the perfect surrounding for all kind of alpine sports. Prepare your Sierra Nevada ski holidays – absolutely confidential and recommended by the MalagaWeb team. 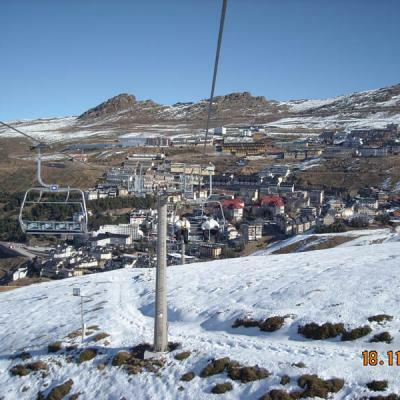 If you would like to take a look at Sierra nevada pistes status, you can check the pistes from home using the following webcams in Sierra Nevada. Images are updated every 15 or 30 seconds so you can check by yourself always the Sierra Nevada snow status and the Sierra Nevada snow report from our blog news. If you are looking for skiing, snowboard in Granada or excursions you may like visiting Sierra Nevada, one of the best ski stations from Europe. Taking a bus from Malaga airport to Granada may not be the most convenient method of transportation if you have a lot of luggage, and the journey can take too long. You can take a Taxi from Malaga to Sierra Nevada, with a very high price so we highly recommend to hire a car in Malaga for a whole week which would cost you less. There is no train link to Granada from Malaga, however you can transfer in Cordoba to Granada. Car hire in Malaga may be a nice and cheap option if you also plan to visit Malaga and Sierra Nevada surroundings. Transfers from Malaga airport to Sierra Nevada is a fast and confortable way if you don´t need to hire a car. Continue reading in how to get to Sierra Nevada ,it could be of help if you are looking for the road route, and if you still have questions don´t hesitate in contacting us in the Malaga transportation forum.